I don’t know about you guys but for me, face mask is such an easy way of enhancing health & goodness of the facial skin! I may probably have one on right now as well; while I sit to write this down. 😆 In summers, firstly my face gets all tacky because of its habitual nature to produce excess oil. As if it’s a government initiative and my skin wants to top the charts of showcasing best efforts and win some Nobel Prize. Duh! Not only face masks help maintain and control sebum but also improves the skin’s texture and appearance. Ask me for one; I’d bring forth ten face masks lying at each corner of my house. 😁 Down the lane when I had spots after an acne attack, this was one of the means which actually reduced my scars and settled any new eruptions. Perhaps that was also the time when I was ‘enlightened’ about the power of skincare! And lately, a new revolution has taken over in the world of face masks. Sheet Masks are one of those resorts for a lazy day wherein you’re too tired for any amalgamation of face mask in powder form and some water or milk. All you gotta do is tear off the packaging, take the sheet mask out, place it onto the face and just RELAX! 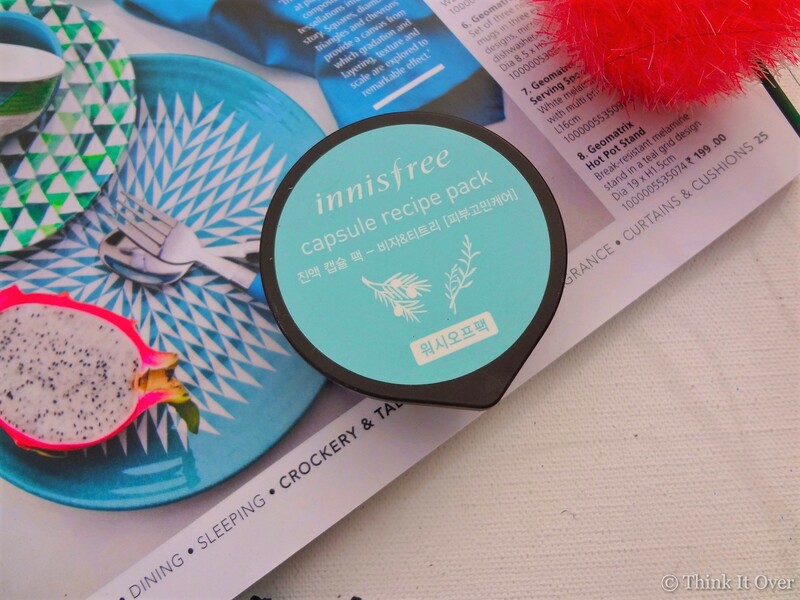 So recently, I bombarded the Innisfree Store. Firstly, I love the fact that the S.A. provides me adequate time and space to roam around, see new launches and pick what I want. Thankfully when I actually need some help, she’d be just a smile away. This was never the case when I went to Sephora Stores. Anyways, so here I am with reviews of the masks that I picked up. Let’s begin..
Let me just be honest, there were millions of masks in sheet form. Some meant for deep hydration, which I avoided because of my skin type. I prefer usually for ingredients such as lemon, tea tree, etc. But lately since I’ve already introduced charcoal in my skincare, to balance out its effect, I chose slightly hydrating ones. Rose comprises of anti-bacterial properties and it helps in soothing down any skin irritations; which is why most of the skin toners have rose as an ingredient. A single component and it soothes, relaxes, tones & moisturizes the skin. The sheet mask does smell of rose, though not too overpowering. The sheet mask in soaked in well amount of the liquid content and it spills at no point. Unraveling the mask isn’t a hassle as well. Although the packaging states that it has to be kept on for like 10-20 minutes, I’ve kept it for around 30 minutes or until the content dries up. The immediate results observed are skin lightening, radiance and moisturized –soft skin. After removal of the sheet mask, I rub in the serum in circular motions so that some of it can go skin deep. There’s definitely some kind of soothing, cold sensation that you’d get while the mask is on. If you follow me on Instagram, few days back I uploaded the story of the three masks and asking which one to try first. And some of the co-bloggers actually told me that they loved Black Berry the most! Black Berry is an ingredient which hydrates, rejuvenates and works extremely well for the combination/oily skin type. Also, it helps in healing of any skin troubles. Though comparatively, this one is a little bit more hydrating than the rose one. Nevertheless, after the apt amount of serum seeps into the skin, I wash off with plain water the excess. And after the usage of these Innisfree masks, your skin becomes soft enough for application of your base makeup. I don’t think I can identify the fragrance of this one very well. I loved the post mask feel! And I feel it stays for the whole day. Usually, we tend to do our skincare regime within the night time; but I like it so much, that I start off the day with a face mask! 😂😂This black berry one is definitely something I’d repurchase! 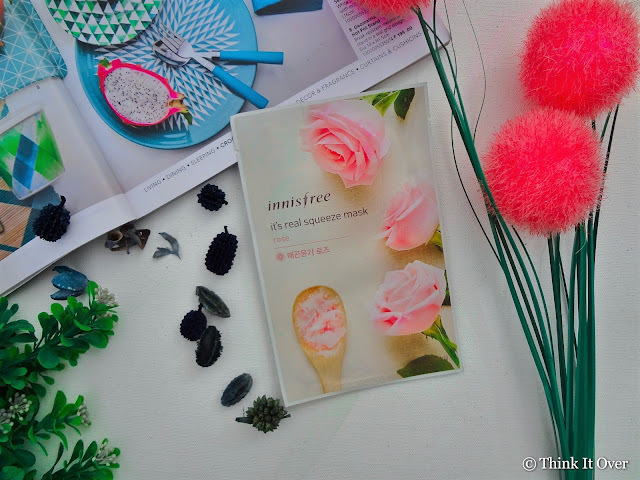 For that matter, I wanna try all the Innisfree range of masks. With the word “Clinic”, I got the vibes that this must be something giving effects equal to the treatments done by skincare experts. I asked the S.A. as to what it works for and she told me it helps in skin firming. 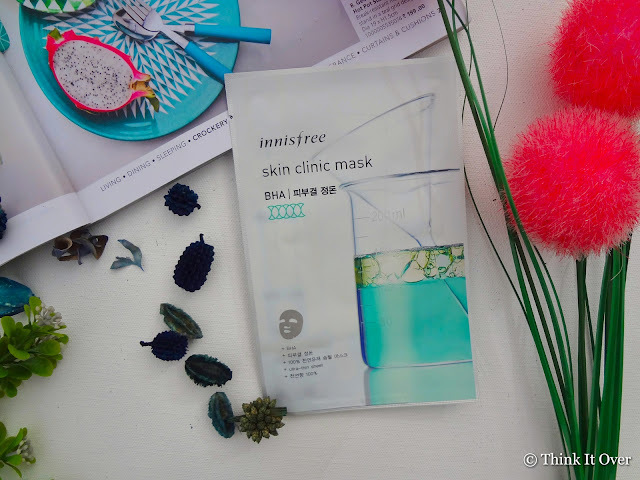 The packaging states- “This fine delicate cotton mask contains BHA to remove accumulated dead skin cells, leaving your skin texture sleek and soft”. I saved this one for trying at the end because I had high hopes from this one. It comes within the same packaging but imprinted design of some science laboratory instruments such as funnel, measuring jar, etc. BHA stands for Beta Hydroxy Acid which is none other than the salicylic acid. If you’ve ever undergone acne treatment, you’d have knowledge about the potency of salicylic acid to get your skin clearer. It works as an exfoliant and BHA makes sure that dead skin cells are cast aside. The mask comes with a film along, which ought to be removed before using. 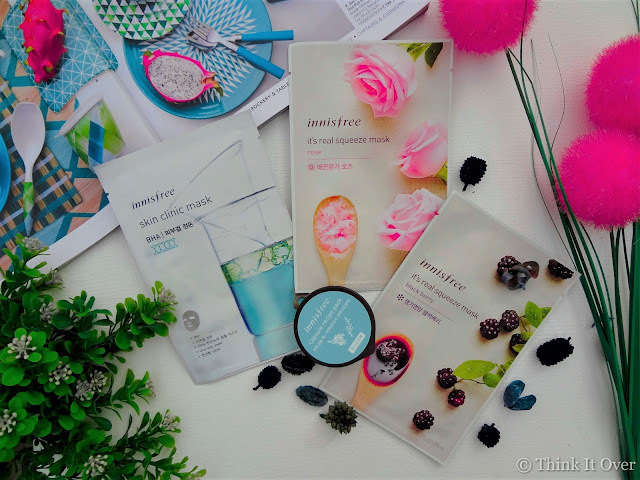 Serum inside is light weight unlike the other sheet masks reviewed in this post. And it also seeps faster into the skin. Seeing these tiny tubs on packaging, I couldn’t resist but add this one as well into my cart. I went with tea tree as I have an acne prone skin, especially during those days. I assumed that because the pack is in miniature packaging, it would most be used up within a single use. But alas, I was wrong! Mine got over after the third use and I was pretty happy to use the content in an optimized manner. Firstly, the consistency of this face is really good! It is easy to spread and feels quite creamy while application. The fragrance isn’t something I can boast about; I ain't a fan of it. But then it isn’t too overpowering so you can still work it out. 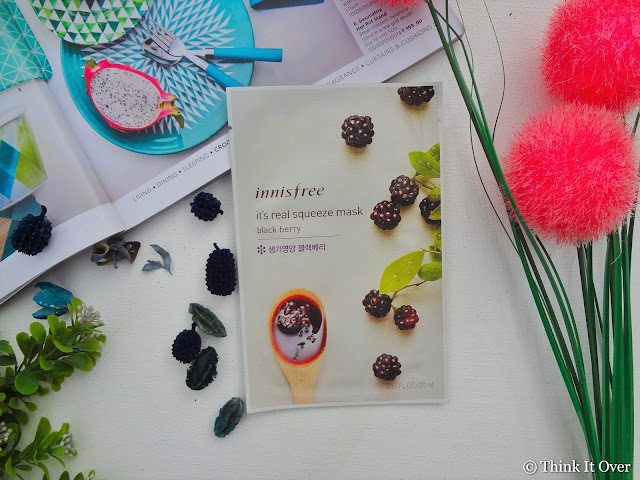 Unlike the other Innisfree masks, and I am talking about the ones mentioned about (sheets ones); this one isn’t dedicated for hydration. It infact takes off any excess sebum but without the skin feeling stretchy or dry. For summers & for the oily skin type people, this is a good pick! It washes off easily as well. Tea tree acts as a shield against the bacteria and ward off acne. That’s it for today! 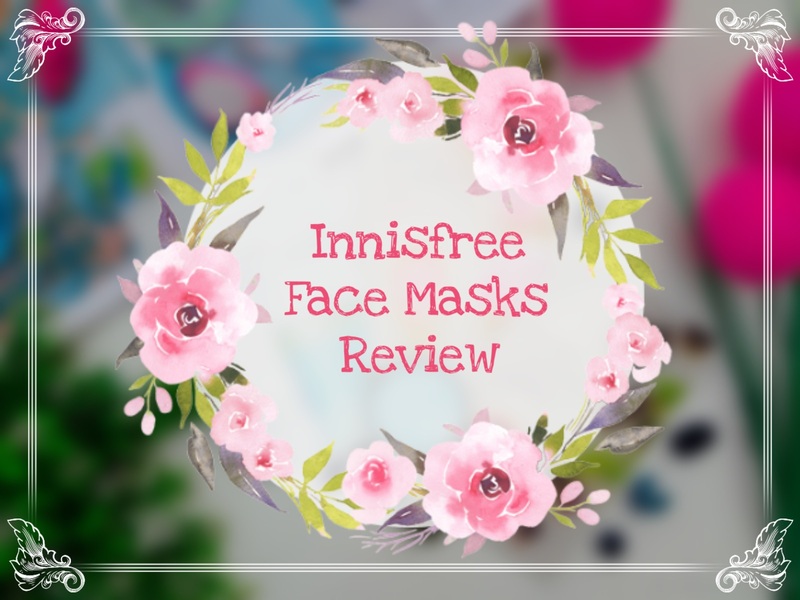 Which Innisfree mask or product is your absolute favourite? Live sheet mask and very nice review. Loved the pics too. Well detailed information. I have the same opinion about this mask sheets. I have tried the rose sheet mask and absolutely love it :) I want to ask about the Skin Clinic Mask. Does it give better effects than the Its Real Squeeze Masks?